You’re Next is like a chocolate pizza: it’s propped up by two flavoursome ingredients, each one carrying a tenancy to be tasty without the other, but ultimately the hybrid doesn’t quite mesh together. And that’s not the only problem, given the pizza is also undercooked. Perhaps I ought to digress from food-related similes and start making sense. Adam Wingard takes scares and humour and crunches them together without unconditional success, in an attempt to make a witty horror film. He’s a smart director with a knack for the genre, which is why the creative funny parts work so well. But as he winks at us with satirical gags and rule bending, Wingard also slips in a helping of bewildered frights. The result is quite a confused outing, but it’s not without merit. As far as family get-togethers go, the Davison clan aren’t having much luck. It’s mum and dad’s wedding anniversary therefore the whole crew have been invited over to celebrate. Erin (Sharni Vinson) tags along with her boyfriend Crispian (AJ Bowen), the latter hoping not to be outshined by his more successful kin this time. During dinner and an all too familiar serving of familial squabbling, a rouge arrow zips through the window. Chaos ensues. The Davisons are under attack. Wingard casts his mate AJ Bowen in the main role opposite the fetching Aussie import Sharni Vinson. Bro points, eh? That’s unfair, because Bowen is actually fairly good at the personally insulted son and brother shtick, but it’s his in-movie partner who exits to the loudest ovation. Vinson is effortlessly charming and likeable, traits not always compatible with female leads in horror outings. Yet it’s her steely determination that convinces most of all; Vinson wears an air of intriguing mystique that coats her character in a bit more depth than is usually on display in these ventures. You’re Next isn’t just one of those ordinarily drab slasher flicks hell-bent on counting change over quality though. Captain Wingard is too canny for that. The signs are plain to see from the get-go. Mother Aubrey Davison, on medication of course, exemplifies the OTT caricature of paranoia as she squeals and weeps her way through intruder anxiety. Others follow suit; from Joe Swanberg’s older brother Drake channelling his inner-Phil Dunphy (if the Modern Family keepsake was a douche), to the bubbly and seemingly spoilt Aimee played by Amy Seimetz. It’s the haunted house, the home invasion, the slasher. But it’s also the family dramedy wrapped in horror and, whilst the horror part flounders, Wingard’s amusing take on tribal bickering within a horror context truly succeeds. Erin epitomises the antithesis of both a drama-contained girlfriend and a scary movie chick. She’s the organiser, someone whose forward movements give her centre stage rather than a background stint. In way she’s us, shouting at every horror cliché there’s ever been. (Don’t go down to the basement, always carry a weapon, keep the windows boarded.) At one point Erin is informed, “I’ve never seen you act like this before”. “It’s a unique situation,” she replies, the interaction an indication of dissolving horror commonalities. In some ways the film is a challenge to audiences, asking us to alter our perception and re-evaluate our willingness to accept and chew on genre staleness. A speech towards the end is a backhanded slap directed at those who gorge in genericism, who subsequently ignore the inventive pieces. Wingard has a palpable gripe. His first three films before this one — You’re Next is actually a 2011 piece — were all met with critical success, but aren’t at all well known. Home Sick? Pop Skull? A Horrible Way to Die? I’m certainly lost at sea. It’s time to rise from whatever rut we’re in and consider the hidden gems. Indeed, if they’re as perceptive as this ruby, Wingard has a point. Unfortunately You’re Next falls flat on its morally-imbued face at times. It’s not scary yet it’s absolutely trying to be. The first attack scene around the dinner table wants desperately to be pulsating but ends up being too over-egged. We’re supposed to become enraptured in the immediacy of a horrifying ambush at home — shaky cam in full flow, drumming music beating emphatically, screams piercing — but it’s all too obvious. Comedy horror can work. An American Werewolf in London, for example, is as humorous as it is nerve-jangling. Here, exists a convolution of aim and execution. Wingard’s aim is valiant and he executes it with fifty percent triumph. The other half, the horror, is out of place. A case of the ‘quiet, quiet, quiet… BANG’ syndrome frequents proceedings. As characters are mercilessly slain we’re left in a state of flux: is this part of the satire, or a genuine attempt to frighten? Apparently the latter. Having said that, the scare attempts do inevitably shower us with some moments of hearty gruesomeness. The film strikes as being a relative of Berberian Sound Studio, its audio effects as squelchy and excessive as they come. At some points the actors are quite literally swimming in pools of tomato-ey blood and guts. Throat slicing takes prominence, letting the soon-to-be deceased discover a cruel twist of fate in their final moment. It’s likely that the filmmakers are making a point about exorbitant amounts of red unfairly equating to disproportionate amounts of green. (That’s cash, as opposed to hash). You’re Next fails to scare us because it leads us to believe that conventional horror simply isn’t scary. It’s a shame then that this falls on the conventional side of things when it’s not being astutely satirical. But Adam Wingard does a lot right and, even though his film mixes an incompatible broth too much, too often, it’s intelligent enough to warrant serious consideration. Who knows, this might even be the inaugural step in a new, smarter horror movement. Excellent review. I saw this the other day and really liked it. I was expecting one of those horribly grim home invasion films like The Strangers so I was pleasantly surprised. It was like a super gory sequel to Home Alone! Ha! Brilliant comparison. I’d love to see that version of Home Alone. This surprised me too, if only it was a bit scarier. Thanks mate. Man, I’ve heard polarising views on this. Still intrigued though. Food for thought mate. You could say my thoughts are quite polarising, but I definitely think the good outweighs the bad. A lot of peaks and troughs here. Haha, appreciate that Alex. Let’s hope nobody actually likes chocolate pizza, or else my argument is unfounded! Terrific review Adam, “In some ways the film is a challenge to audiences, asking us to alter our perception and re-evaluate our willingness to accept and chew on genre staleness.” <— I really really like this. The very character that Sharni Vinson plays seems to exemplify this very notion, and I personally thought the movie pulled it off. That said, yes there are some problems going on. The acting isn't great. Some of the kills lean towards cliche more than refreshing, and the opening twenty minutes of this seriously caused me to consider heading towards the exit. THere's no excitement until the entire family starts falling apart, which is a bit sadistic and speaks to the frenzied state the horror genre has finally led its collective audience. Thanks Tom. I completely agree about the Erin character, she’s great. It’s a shame none of the others are really that wholesome – often too clichéd or simply underdeveloped. Indeed, the film certainly goes a bit mental after a quiet and quite boring opening half hour! Good review. It doesn’t do much with its simple premise, except just have a great time with itself and because of that, it’s a good time. Albeit one with plenty of blood and violence. Yep, I enjoyed it. Certainly for the dark comedy brought to the table. It’s smart too, Wingard adds a satirical backbone that works well for me. Cheers Dan! I had issues with this as well despite thinking that it was fairly decent. Sharni is an excellent scream queen and a beautiful woman! She kept me entertained throughout! Do you want to know what my main problem was here? The fact that the baddies kept taking off their masks. That alone ruined half the scares…. Ha, yeah that was a bit annoying. I guess Wingard might’ve been trying to go for another bending of the rules type thing. Who knows! It does kill some momentum, particularly in the fright-department. Thanks for the recommendation, Adam. I’m going to watch it tonight. No worries, I hope you enjoy it! Certainly has something to offer. I’ve watched it now and I can tell you I liked it. It’s pretty similar to The Strangers (2008) and The Purge (2013), both of which I also enjoyed. For another good film in a similar vein, try Vacancy (2007) if you haven’t seen it already. Thanks for the tip, Adam!! Can definitely see the similarities between those two and You’re Next. Both good films too! I think I’ve seen Vacancy (the motel flick?) and enjoyed it, thanks for pointing that out though. That’s right – it’s the motel one. I really like that one; it gets under your skin, unlike the other films. Good review. 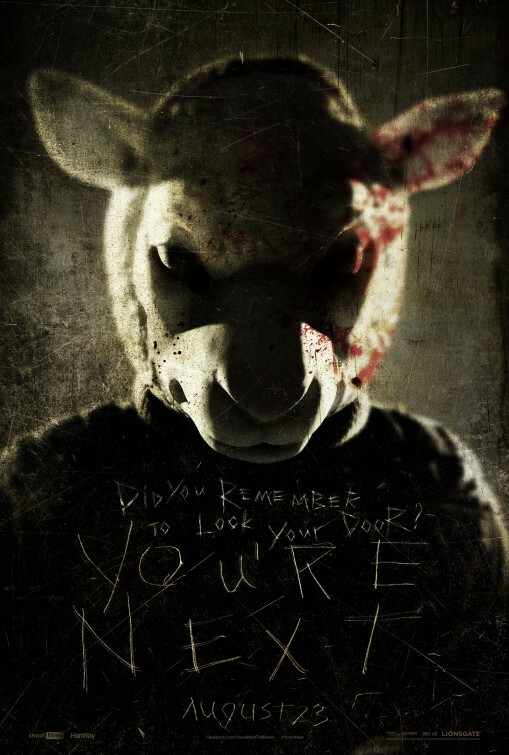 I liked You’re Next, but then I watch a lot of horror films and the majority of them are crap, so standards are low! Haha, at least you sort of liked it then! Thanks Laura. Great review! I agree with a lot of this. 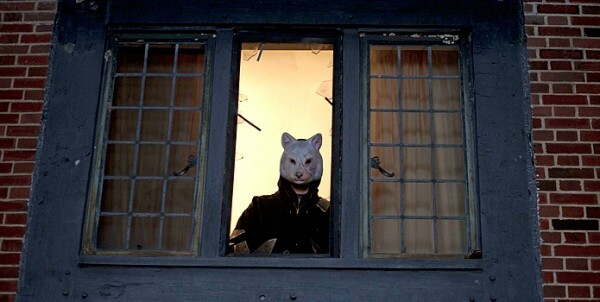 You’re Next is a wasted opportunity and fails to bring anything noteworthy to the used-up home invasion story. However, it does feature some impressive scenes, kills and gore and is entertaining for the most part. Exactly, not the most inventive home invasion horror flick, but certainly an interesting take on the genre in general. And it does look really lovely. (As morbid as that sounds). Shame you didn’t like this one a bit more! It could’ve been better, but I actually thoroughly enjoyed it–mostly due to badass Erin, of course. For me, the only one better than this last year was The Conjuring, which rocked. 🙂 Great review, Adam! Badass Erin is great. She’s the best thing about the film. I really liked the witty intellect in regards to the horror genre, but it just didn’t scare me. Thanks Cara!